When it comes to bison, Executive Chef Josef Wiewer is what we’d call an expert. As a signature placeholder on the menu of Calgary’s Wildwood restaurant, bison has quickly become a favourite of both Wiewer and his customers. “When we first opened Wildwood 4 years ago, we wanted to profile Rocky Mountain cuisine and focus on local ingredients,” says Wiewer, “bison fit right in.” That’s when he discovered the benefits and versatility of bison. Wiewer says bison is the most featured item on the menu and is an irreplaceable staple. The menu is not small either. It boasts everything from appetizers, Buffalo Bites and Bison Carpaccio, to Wiewer’s sensational buffalo ribs and newly featured Bison Tenderloin with Chocolate and Raisin Sauce. “At first, people may be intimidated to cook bison, but once you understand how to handle the meat – it is lean and shouldn’t be overcooked – there is no reason someone at home can’t make a wonderful meal,” he says. 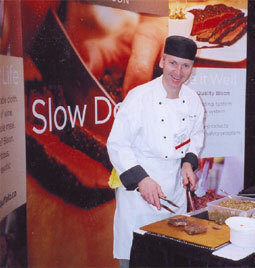 Not only does Wiewer promote bison in his restaurant, he has been involved in many events held throughout North America. People have experienced his culinary talents firsthand at events such as the Calgary Stampede and at tradeshows in the United States where he demonstrated how to prepare bison and provided thousands of samples. Volunteering most of his time, Wiewer has no doubt contributed to the growing popularity of this lean, natural, and tasty meat. Wiewer promises he will continue to develop new recipes for us to enjoy and if they’re anything like Wildwood’s Bison Ribs, there’s no doubt I’d make the trip to the Wildwood in Calgary, Alberta to enjoy a fabulous meal.